Spring is here-ish: OK, so the forecast in the northeast calls for freezing rain, hail, and temps in the low 30s — but after this brutal winter, even the calendar arrival of spring is something to celebrate. Seconds to spare: The men’s basketball team pulled out a win in last night’s CBI opener, a true nail biter vs. Hampton. “They fought us all the way to the end,” Tim Frazier told the Centre Daily Times. GoPSUSports has the recap, and the CDT has some great pics from the game — though I’m partial to this shot: an Instagram posted by @pennstatembb after the big win. IM so excited: Take a look at the new and improved IM Building, courtesy of Onward State. OS’s Anna Ungar got a peek inside the newly renovated facility, which should be open for business by the end of the month. More room for fitness classes, three basketball courts, a colorful lounge area, and two revamped fitness centers are some of the highlights. Class of 2029: Now here’s a story that will make you smile: A group of first-graders from Katy, Texas, already have their sights set on Penn State. 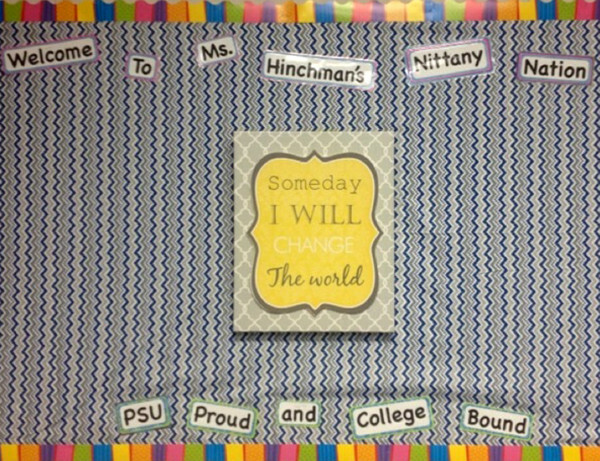 Alyssa Hinchman’s class at McFee Elementary School in the Houston suburb “adopted” Penn State as part of the No Excuses University (NEU) program, which helps at-risk kids learn about secondary-education opportunities. Check out the classroom bulletin board (above). Entry filed under: University Park. Tags: Anna Ungar, IM Building, No Excuses University, Tim Frazier.